Street view of property. Living room with covered front porch. Living room with covered front porch. Living room with covered front porch. Living room with covered front porch. Living and dining areas Dining area Dining and living area and ktichen Kitchen Kitchen Living room front porch. Living room front porch. 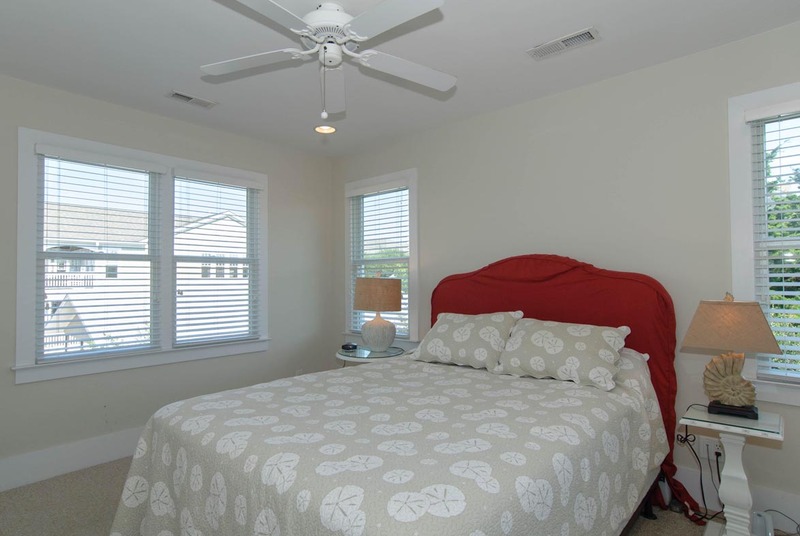 Master bedroom with king bed and private bathroom. 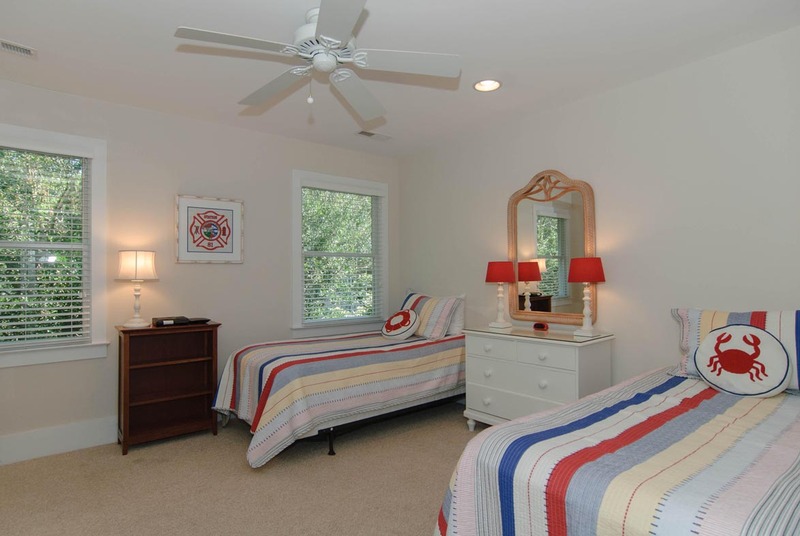 Master bedroom with king bed and private bathroom. Master bathroom. Upper level bedroom with double bed and shared bathroom. 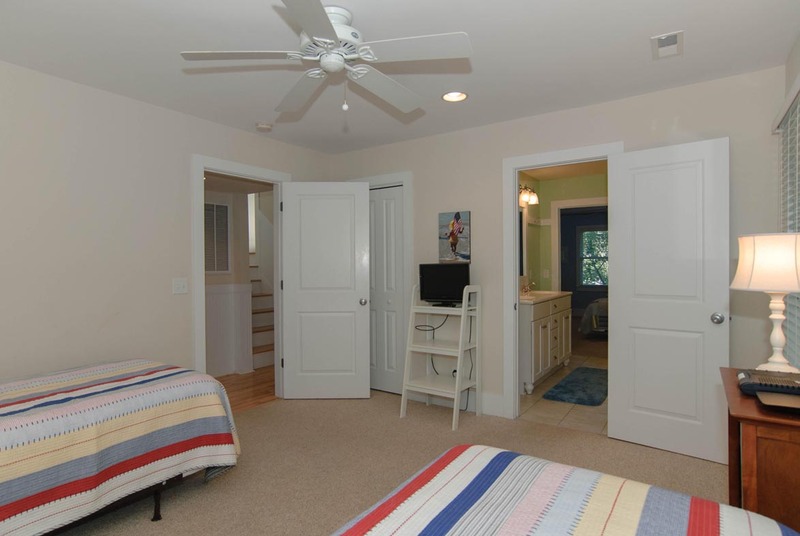 Upper level bedroom with double bed and shared bathroom. 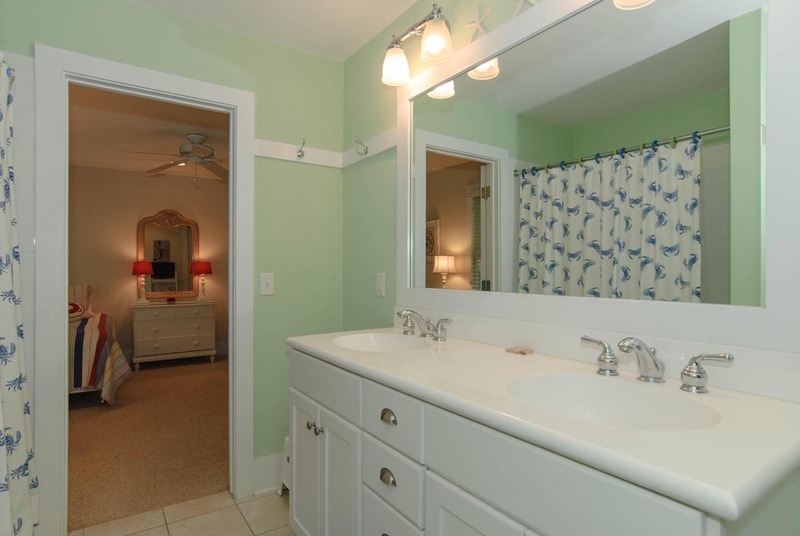 Upper level bathroom accessible from both the bedroom and den areas. Upper level den area. Upper level den area. Upper level den area. 2nd guest bedroom with 2 twin beds and shared bathroom. 2nd guest bedroom with 2 twin beds and shared bathroom. Shared guest bathroom. Guest bedroom with 2 twin beds and shared bathroom. Guest bedroom with 2 twin beds and shared bathroom. 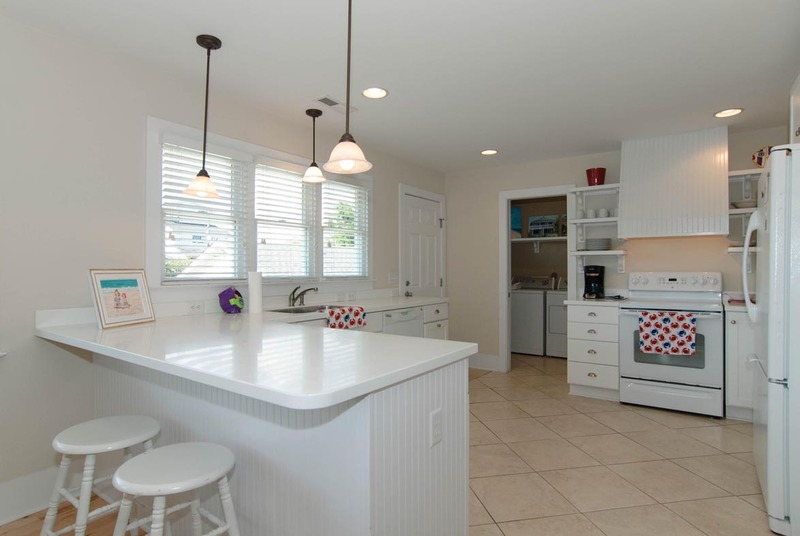 Treat your family to a memorable Wrightsville Beach vacation in this charming and comfortable single-family 4 bedroom, 3.5 bath home! 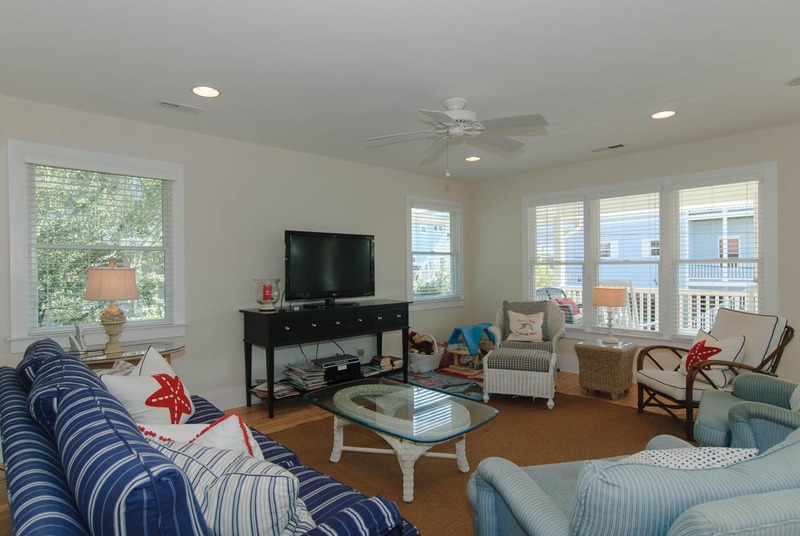 Located on a quiet dead end street at the desirable south end of Wrightsville Beach it’s an ideal place to enjoy the ocean and the sound. Little ones will have a great time swimming and playing in the gentle sound waters! The beach access is directly across South Lumina, ½ block away. Take a stroll along the shoreline past the jetty and explore the pristine dunes near Masonboro Inlet. The home’s main level has a spacious a kitchen/dining/living area that opens to a wonderful covered porch with rockers and swing. 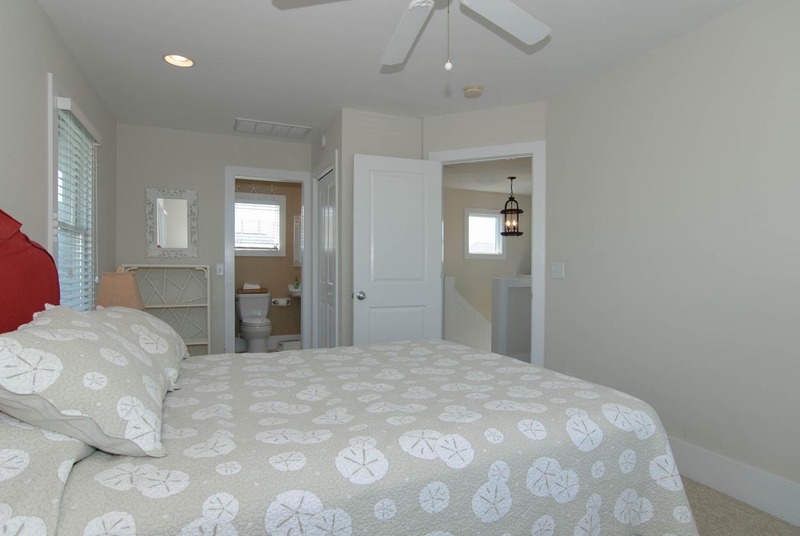 The master bedroom with a private bath, two guest bedrooms that share a buddy bath and laundry facilities are also on this level. Upstairs has 1 bedroom, 1 bath and a sitting area perfect for reading, napping and gazing out to the sound. 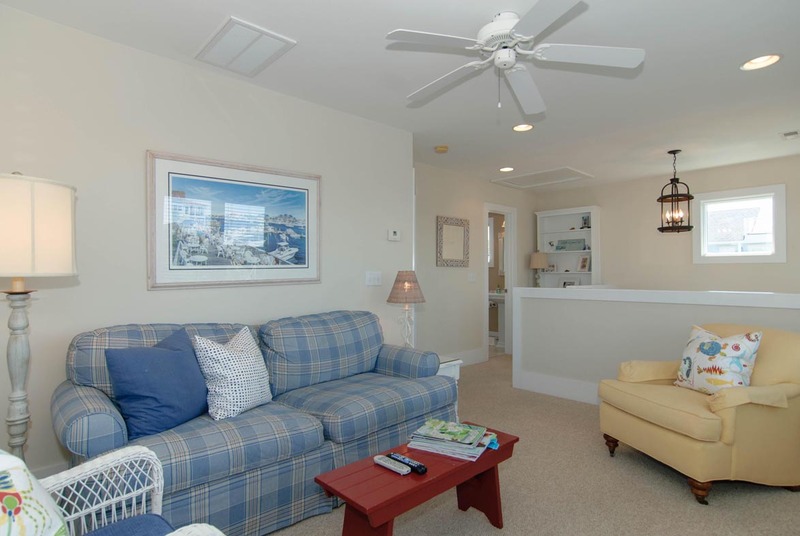 Be one of the many returning families who have enjoyed this popular vacation spot! Outside Shower. Ample parking in carport and driveway. Occupancy: 8. No Smoking. No Pets. We have returned here several times over the years. There has been some price and management fee creep. The property is well-furnished and very well maintained. New strong wi-fi was installed this year and new furniture and painting occurred. We would recommend this place highly. Great house. Kitchen very well-equipped. Wonderful breezes on porch. Close to the beach! This is a great beach house! 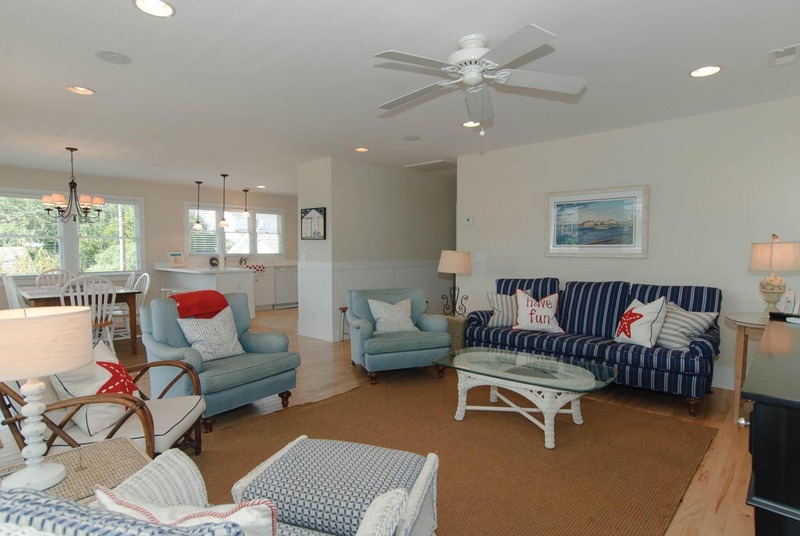 The location is quiet and so close to the beach. We also loved the big front porch. Whenever we were at the house, we were always sitting on it. The porch was shady with a nice breeze. The house also looks better in person than in the pictures. I felt it was much more spacious than what the pictures show. We had 7 people and it never felt crowded. My only tiny issue was with one of the air conditioner vents in the upstairs bedroom. It was directly above the bed. It was noisy and blew cold air in our face at night. Overall, I definitely recommend this house. We had a wonderful stay! We have returned to 4 Corbett for several years. Great house and location. Minor issue: I would upgrade the cable if I were the owners. The wifi seemed better this year. Liked convenience of renting grill from Bryant; used a lot. 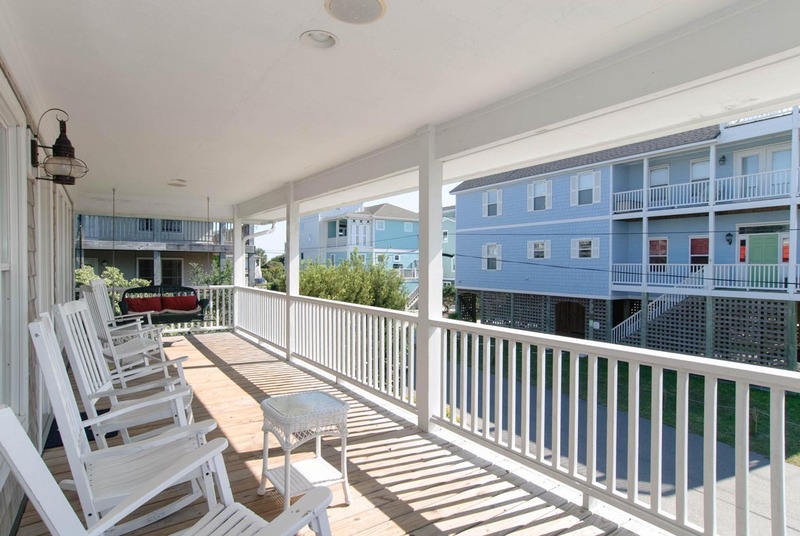 Robert- We're happy to hear you have visited with us for several years, the south end of the beach is a great spot! Hope to see you for many more years to come! 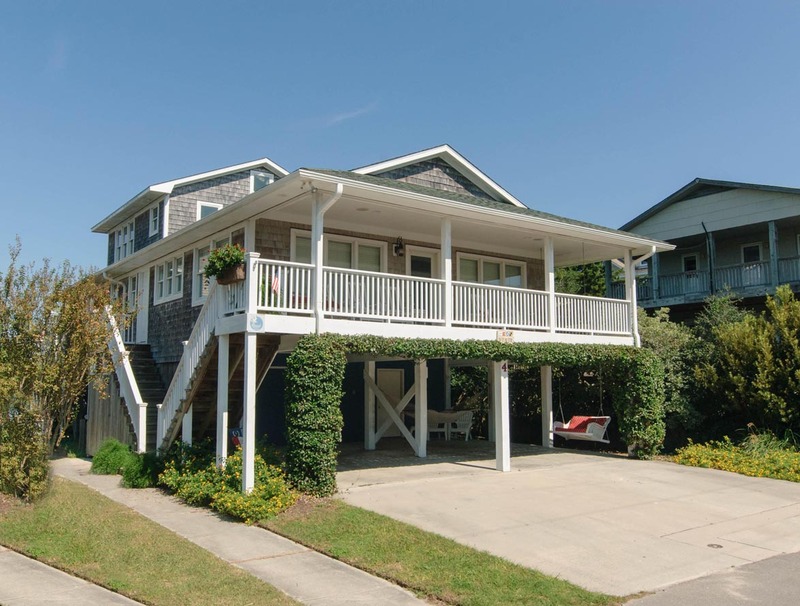 Three generations of us enjoyed this beach house. Great location for us to walk to the Oceanic. The front porch was our favorite place to gather. 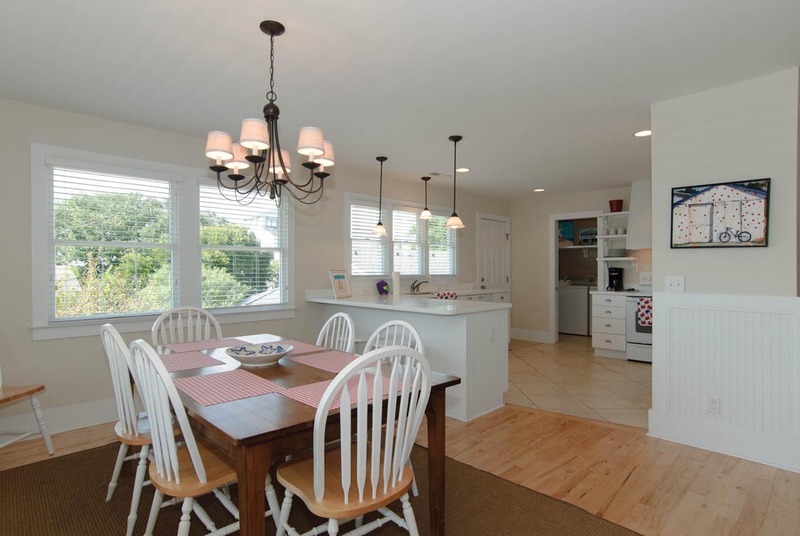 Professional job by agency - well-maintained and very beautiful home. Well equipped, spotless modern home. Even when hot outside, nice ocean breeze on porch. This was our second time renting this house. We love it. We had a wonderful time with our family. Even though the first few days were rainy, we enjoyed sitting on the front porch together. The swing is awesome. Would like to have one like it for my front porch at home. Would the information on how to get one. This was our second time staying at this house. 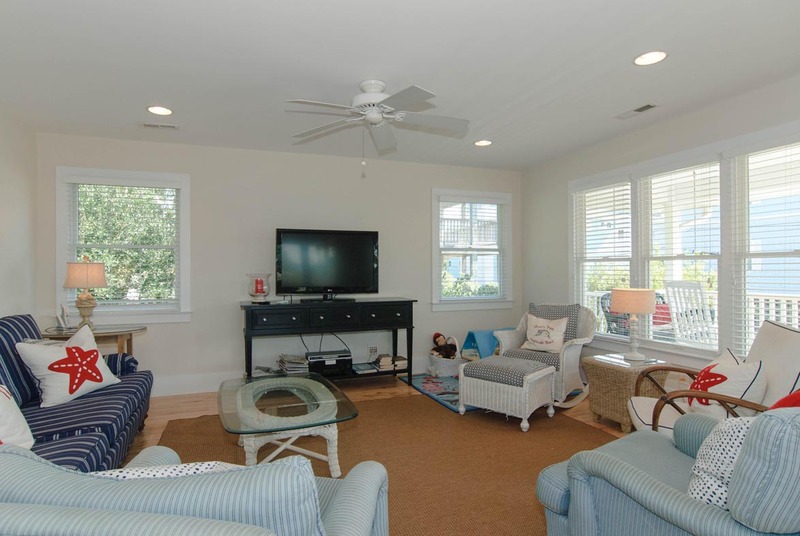 It's a beautiful house in a great location, with a great floor plan, just a short walk to the beach. Robert- Glad you enjoyed!! Hope to see you again next year! Excellent home with a great rental management company. We had no problems and were pleased with the kitchen items. The house was clean and well maintained. A short walk to the beach yet tucked away from the main drag. David- We are glad to hear you had a great week at the beach... hope to see you again soon! Great property on a quiet street that is very close to both ocean and sound. Weaver is so welcoming - clean and well-decorated - perfect space for my family (2 adults and 4 middle-school/high-school kids). We loved the porch swings and the easy walk to "The Post" for lattes in the morning and gelato in the evening! We hope to return to the Weaver!